Duathlon Results, Trail Results, Race Report, Photos. 2019 Final info email out to competitors: Come back later! The Hurtleberry is set in THE HURTWOOD, a unique and beautiful woodland in the heart of the Surrey Hills, an area of outstanding natural beauty. Car parking is on site and a short walk from the Event Village. The car parking is accessed through Holmbury Hill car park (RH5 6NU) off of Radnor Road, where there will be marshals to direct you. Follow the signage to the Registration. Starts will be from 09:00am. 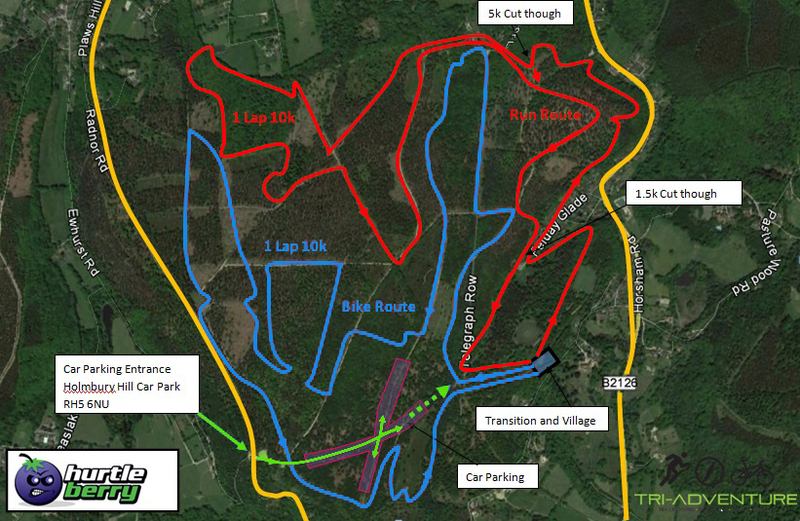 09:00am – This signed woodland run will follow the same route as the first part of the Duathlon. Don’t fancy doing any running? Then take part in only the Mountain Bike route. This 2 lap, 20km course will be a challenge in itself. = £25 (£30 OTD). This will set off with a staggered Start between 09:20 and 09:30am. 10k run with your dog = £22.00, (£27.00 OTD) 09:05am – We welcome the running with dogs. Please indicate on your entry that you intend to run with your dog. This Duathlon event will be chip timed and will start with a run. Competitors will follow arrows guiding them through the woodland before returning to the event village to pick up their bike from the transition area. Arrows will then be followed round the bike course which again will bring competitors back to the transition area where their bikes will be left to then head off on the final shorter run to the finish. This is going to be a great event on what can be quite a challenging course with fire tracks and single track parts on the bike. There is also now a Relay option so that you can share the experience with your friends. The fee for this is only £5 more than a solo entry. For teams of 2 or 3, one can run while the other cycles. Cut-offs, There will be a cut-off on the Full Duathlon. You will need to have started your final run by 12:30pm. Prizes have been provided by Alton Sports for the Duathlons and Trail Runs. There will be a Prize Giving Ceremony once the majority of the field have finished and times verified in each category. This will be at approximately 11am for the 10k, Canicross, and Sprint Duathlon and 12:30pm for the Full Duathlon. Nearest Station is Gomshall, 4.5 miles cycle away. Free Off Road parking on-site, medical cover, refreshments, chip timing. There will be some basic Mechanical Support on the day.